Rough Stuff Entertainment is set to bring the music to the beach as Zambali Summer takes place on April 20, 2019, Black Saturday, in Brgy. La Paz, San Narciso Zambales. 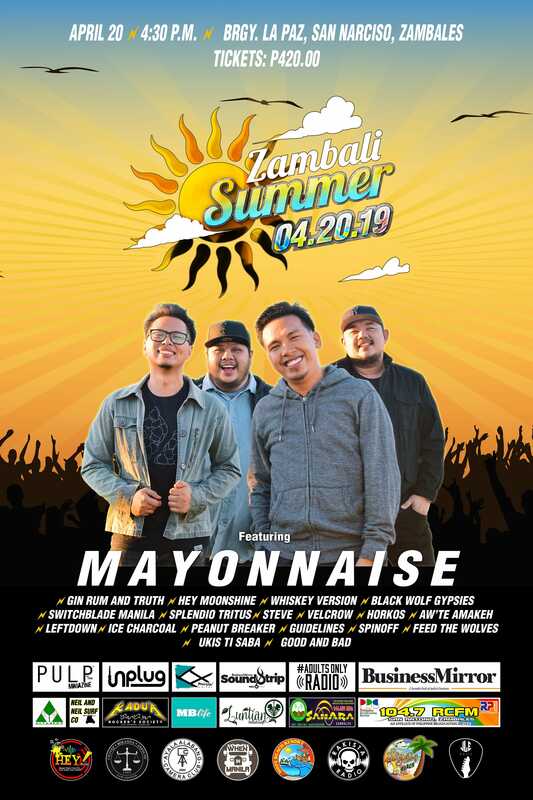 A musical celebration of love, life, and faith, Zambali Summer is a music festival set to take place at one of the country’s most beautiful beaches—the beach coast of Zambales. Happening on Black Saturday, the event promises to be the perfect day to celebrate great music at the beach with friends or family. The Festival will be headlined by Mayonnaise and will also feature performances from the following acts: Gin Rum and Truth, Hey Moonshine, Whiskey Version, Black Wolf Gypsies, Switchblade Manila, Slendio Tritus, Steve, Velcrow, Horkos, Aw’te Amakeh, Leftdown, Ice Charcoal, Peanut Breaker, Guidelines, Spinoff, Feed The Wolves, Ukis Ti Saba, and Good and Bad. Tickets are priced at P420.00, and the event begins at 4:30PM.